Happy New Year! I hope you enjoyed the holiday season and here’s to good health and good fortune in 2015. Speaking of holidays, school is out for summer in Peru so both kids are home 24/7 and it’s a bit of a challenge to entertain them as it is also rainseason here in Cusco. Have I told you yet what an adventure it is to take our kids out on the town? Whoever coined the phrase “terrible 2” knew what they were talking about. 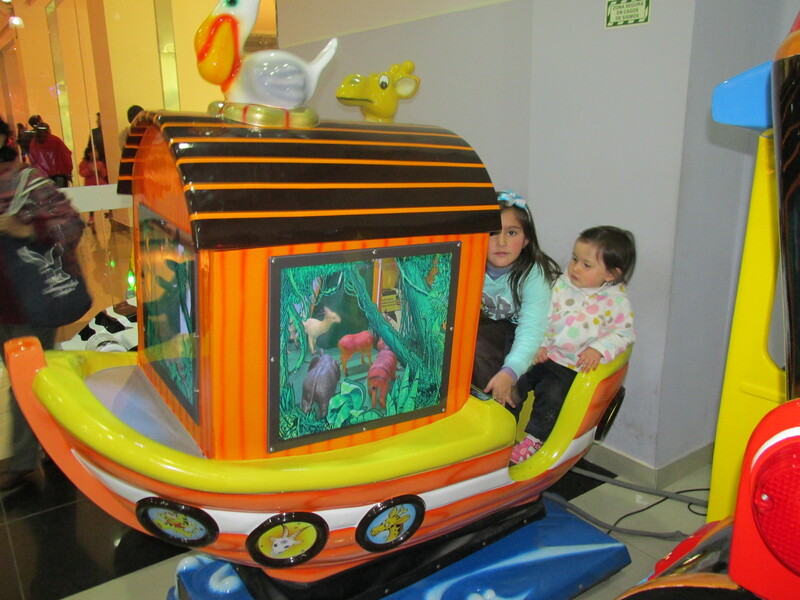 Yesterday we took the kids to the movies, the one and only movie theater in Cusco is at a new-ish mall near our house. After the movie we were leaving the mall through the big ProMart home improvement store when we caught our youngest trying to flush her leftover popcorn down the toilet in one of ProMart’s exhibition bathrooms. A while back I took both kids to that same mall by myself. I wanted to prove a point to Mamacita Linda: not only could I take both kids by myself, I could even accomplish something useful while I’m out and about with them, in this case buy a new pair of sneakers. I let the kids play for a bit in the Coney Park playground at the mall and then went sneaker shopping. In the shoestore my oldest all of a sudden realizes they are missing a toy phone they brought with them to the mall (which was a bad idea in the first place). We run back to Coney Park without any real hopes of finding the toy but to my surprise it was laying untouched by one of the games we played earlier. A friend of mine once left his wallet in a taxi in Dubai and the taxi driver returned to the hotel 20 mins later to give him back his wallet, insisting my friend check the contents to make sure nothing was missing. Here in Peru it’s rare to find something after you leave or forget it somewhere. But I was going to tell you about maintenance. Before the lost phone incident, my kids were playing in a helicopter ride/toy at Coney Park. I was a bit suspicious because a few days prior I’d seen the helicopter tagged “out of service” but the tag was no longer there so I figured it had been fixed. The kids got in the helicopter but about halfway through it’s up-down left-right cycle, the machine seemed to get stuck and started shaking violently left to right, tossing my kids around as if they were limes in Jimmy Buffett’s blender. I yanked the power chord out of the wall and with a crying kid in each arm I advised the Coney Park staff their helicopter was broke, whoever “fixed it” didn’t get to the root of the problem. This was before the lost phone. When we came back to Coney Park 15 minutes later looking for our toy phone, the manager was standing by the helicopter, watching another batch of kids go up and down, left and right. The machine worked OK for the moment so apparently it was considered “fixed”. A broken toy is a minor inconvenience but in bigger issues like infrastructure the same attitude seems baked into the culture of Peru: don’t fix it as long as it kind of sort of works most of the time. This entry was tagged Margaritaville, Peru. Bookmark the permalink.